Hello once again fellow scrappers! Today's page is a favorite of mine. I absolutely love this candid shot of myself with my two fave guys--my husband & my little fur-baby Toby. 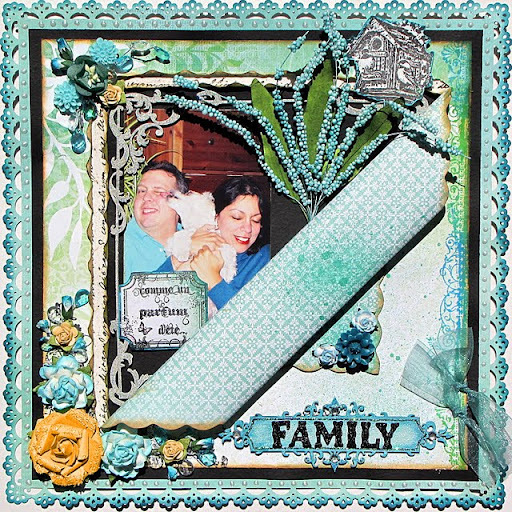 I used papers by Kaisercraft's Chapter One collection. It coordinated perfectly with the colors in the photo itself. 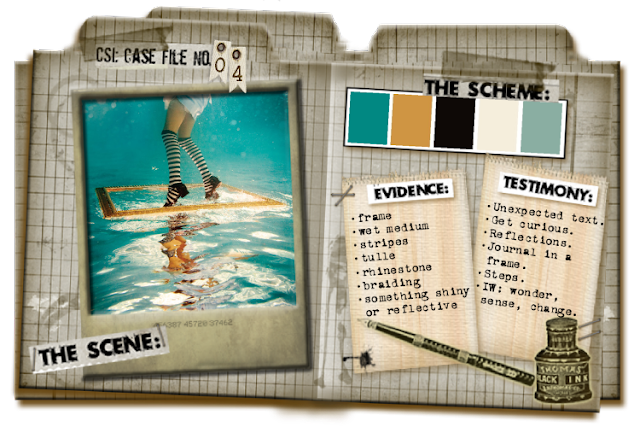 The colors also went just right for Case File #4 going on over at C.S.I. To create the inner frame--I cut a large triangular shape into my paper and then 'peeled' it back, rolled it once and just left the outer corner out. (I hope that makes sense!) Oh & prior to adhering everything down I inked all the edges to make them stand out more. This is the challenge from C.S.I my page is based on. This is a stamp by Stamp Enjoy. I further decorated the image with Stickles & inked the edges to make it stand out more. I used Martha Stewart's Deco Flowers punch for the border. The edges were inked to allow them to stand out more. I further highlighted the border with dots of white opal liquid pearls. The flourish chipboard frame seen here is by Dusty Attic. I painted it first with white acrylic paint & then heat embossed it with clear Star Dust embossing powder by Stampendous. Another very cute stamp by Stamp Enjoy. The large spray is by Petaloo. It's one of their Color Me Crazy Sprays...I spritzed it with a teal glimmer mist so it would match my page. The label holding my title is also by Dusty Attic. The label went through a couple extra steps in order to give it more texture. It was first painted with a teal/blue metallic acrylic paint. I then gave it a coat of clear crackle paint (Rock Candy). Once dry I lightly spread a bit of Frosted Lace Stickles on it with my finger. 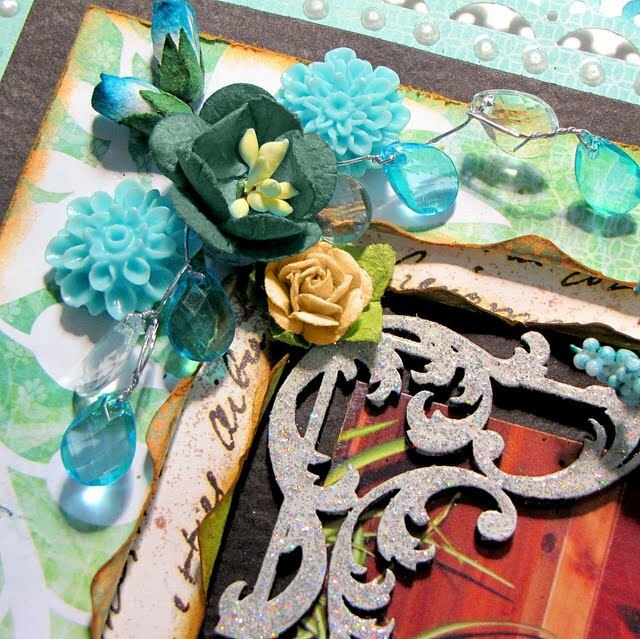 I added more Frosted Lace in the center of the label & spread it out thinner with my finger towards the edges. I next highlighted the edges of the label with Stickles and finished it up by adding two rhinestones. Thanks to all of you who stop by for a visit and I hope you all have a fabulous weekend! I'll have to try that peeled back triangular piece. Just great! Love the doggie kiss and the blues. Divine, Kay!!! Love the candid shot too, but the page is exquisite! Beautiful again this week Kay, love the way you took the evidence and used it, just wondering on the Testimony part of the challenge as I unsure of what the wording is on the photo.